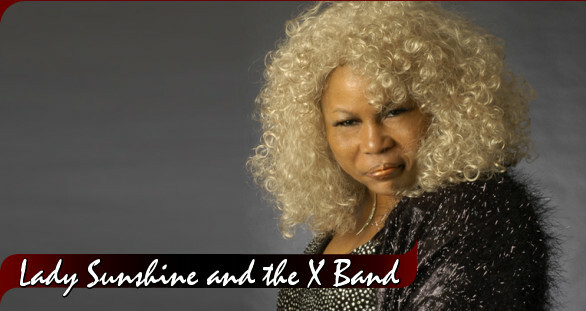 Lady Sunshine and the X-Band was formed in 1994 and has been causing quite a stir since then. The Stax-Volt legacy is definitely alive and kicking with these players! This group is a product of the Motor City and is a reflection of the very essence of Detroit – Emotion, Fire, Pride, and Soul. The LSX Band has had the honor to share the stage with Blues/R&B notables Koko Taylor, Bobby Rush, Little Milton, Roomful of Blues, War, Liquid Soul, Sir Mack Rice, Spyder Turner [The Chicago Blues Legends]-PineTop Perkins, Willie Big Eyes Smith, James Cotton,Carrie and Lurrie Bell, Lonnie Baker Brooks, Hubert Sumlin, Bob Margolin, Lil ED and the Blues Imperial’s, Maurice John Vaughn,] James Smith, Bobbie Rogers, Maurice Davis, Tommy Castro,Mel Waiters ,O.B.Bucanna and blues man Carl Sims ,andJust recently shared the stage with Keiko Matsui, Alexander Zonjic,Walter White,and Big Bill Morganfield! Lady has also shared the stage with Kim waters ,Reuben Studdard and the mirecles review and the motor city horns and Johnathan Butler! Lady Sunshine was born to sing the blues. Born on a plantation near the Mississippi Delta in West Helena Arkansas, Lady Sunshine grew up singing gospel music as a little girl and is definitely the ‘real deal’! Sunshine is the consumate entertainer and that deep soulful southern hunger that drives her is apparent both on and off the stage through her heartfelt originals and down-to-earth demeanor. She moved to Ann Arbor, Michigan in 1975 and began performing professionally in genres such as Blues, R&B, Gospel, Soul & Jazz. Although Sunshine lives in the heartland of the University of Michigan Wolverines, the chants of ‘Let’s Go Blue’ take on a whole different meaning for her. The Rhythm Section, comprised of (Slick) Rick Humesky on guitar, Kito Pardo on drums,Smokin Joe Aranda on bass, and Tom (Fossdog) Fosselman on keyboards, is a rock steady groove machine with such a deep pocket that no matter what style you ask for, be it Blues, Funk, R&B, Soul, Rock, Jazz or Latin, you’ll get a groove that is authentic, precise and pumpin’. The ‘Xsatiable Horns’ are comprised of Patricio Padilla, David Maki II, and Ken Ferry. These cats are powerful, air-tight, horn phenomes, accustomed to playing as a compact and symbiotic unit in addition to being virtuostic soloists in their own right. Their ‘Phat’ sound has been described as a fusion of the Memphis Horns, James Brown Horns, and Tower of Power Horns rolled into one unique and Xsatiable package.